Our travel with On the Go Tours had taken us from India across the border and into Nepal. The reduction in activity was unmistakable. Things just didn’t feel as rushed or frenetic. Maybe it was because our stop the night before was Lumbini, the birthplace of Lord Buddha, or maybe it was because the Himalayan nation of Nepal is just not as crowded as India, but I could already feel myself decompressing. I was excited to be staying in Chitwan National Park, a UNESCO world heritage site just at the foothills of the Himalayas. Chitwan, meaning ‘heart of the jungle’ has a reputation as one of the best wildlife photography parks in Asia, and I was itching to try out my new Canon EF 100-400mm f/4.5-5.6L IS II USM Lens that I had been lugging along. With over 544 different species of birds, monkeys, deer, crocodiles, wild elephants and one-horned rhinoceroses, I thought maybe, if I were lucky, I would have a good chance of creating some good nature shots. If I were lucky, maybe I would see one of the few Bengal Tigers that remain in the wild. Crossing a Stream into Chitwan National Park. It was extremely foggy when we woke after a good nights sleep at the luxury Machan Wildlife Resort on the edge of the park. The weather was perfect the day before when the resident guide took us out for a tour of the area, but it was easy to tell as night fell and we enjoyed an excellent meal and a few beers, that the weather might not hold. I was a bit skeptical that we would be able to see anything of interest as we loaded up in the Jeep and went into the park. It was a bit cold as the driver carefully drove through the fog and trees, down gravel paths and over grassland. 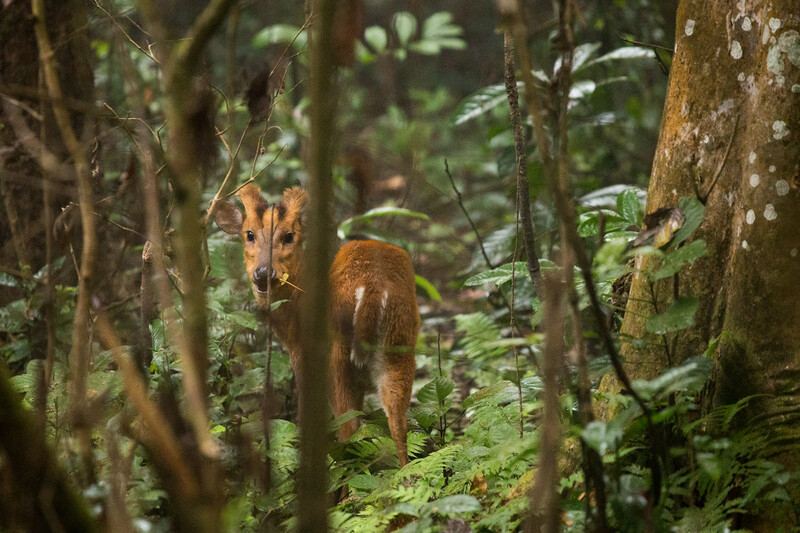 Suddenly he stopped, and the guide pointed into the forest where a small Barking Deer stood carefully watching us. 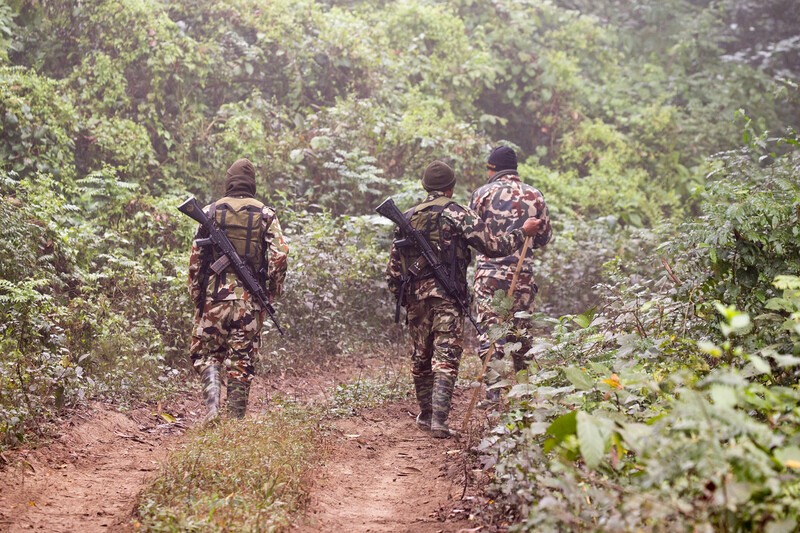 As we continued, we came upon three soldiers carrying machine guns walking along the forest road. 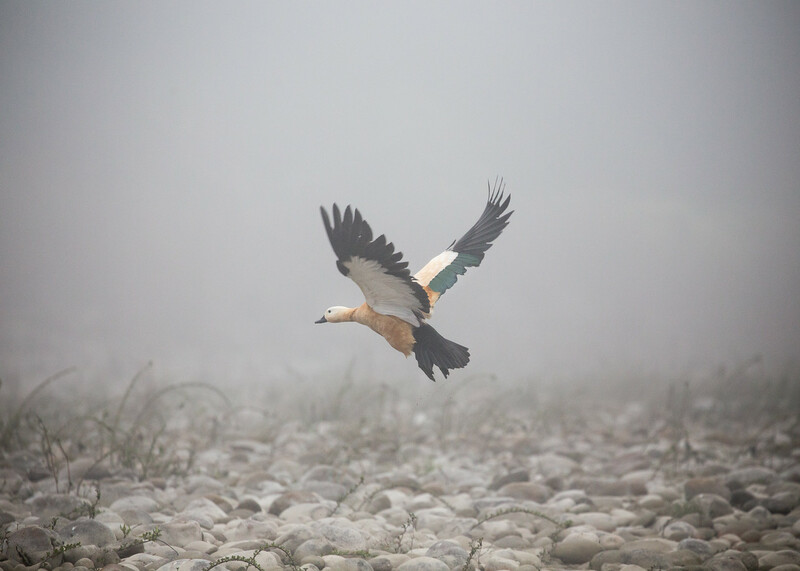 Protecting Nepal’s wildlife heritage has become a priority in this country, that is heavily reliant on tourism, and the soldiers are authorized to shoot poachers on sight. We were driving to meet up with one of the locals for a ride on the East Rapti river. 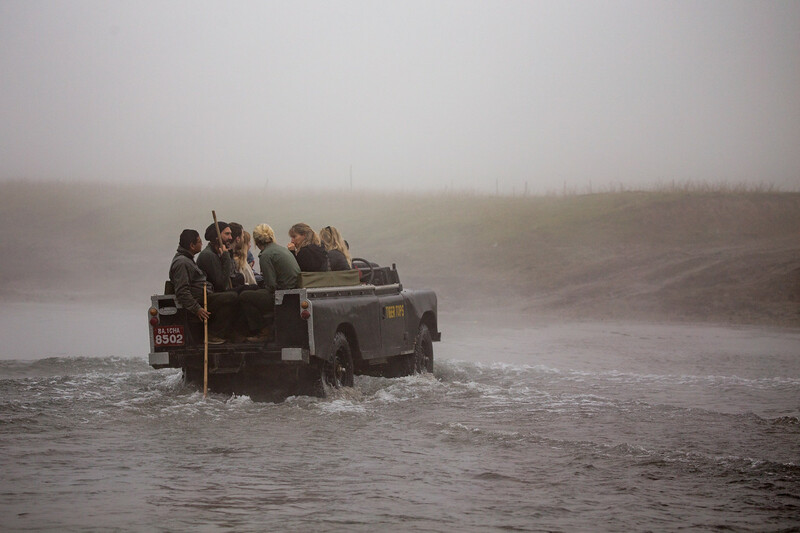 As we turned the corner to where the boat was docked the guide, in an excited whisper, gestured to show us through the fog where a rhino was wading in the water. I grabbed my camera, hopped out of the Jeep and started carefully walking along the shore. The guide cautioned against getting too close, so I held back as the ancient armored beast, detecting our presence, slowly walked back into the jungle. I was able to get a few shots, nothing worth submitting to National Geographic, but I was excited to see a rhinoceros in the wild. Carefully we stepped into the old wooden boat, and the boatman began paddling us into the river. Fog kept the visibility low, but there was still much wildlife to be seen along the river’s edges. I was able to get a few decent photos of Ruddy Shelducks in flight. Eventually, I put my camera aside and just enjoyed watching and listening to the sounds of nature accented by the rhythmic drumming of oars on the gunwale. The sun was just beginning to break through the clouds as we arrived back at the lodge for lunch. On the Go had arranged for a few options during the afternoon, but we impressed upon the guide that we wanted to return to the park now that the weather was improving. He agreed, and as we reentered the park, it was as if, during the improved weather, we saw what seemed to be an entirely different place. 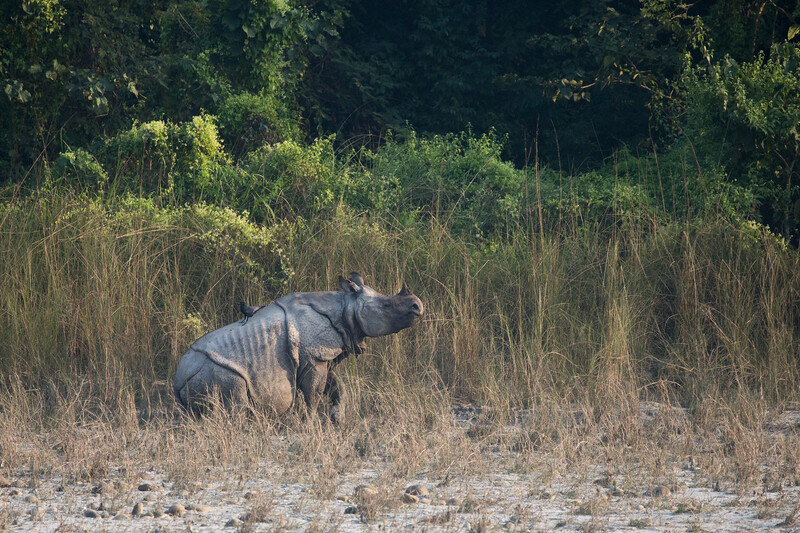 There were crocodiles sunning on the riverbanks and in the fading light of afternoon we saw another rhinoceros across the river out for a casual stroll. As we exited the park, we came across a sports pitch where an elephant polo team was just ending their practice for an upcoming match. A day that started out with such uncertain weather, turned out to be one of the most memorable in a long time. I am a great fan of you and your travel lifestyle. You visited some places like Varanasi etc.. in India…right? Then, why you didn’t mention “India” on your top menu under “Travel” drop down list? on your website. Please add India on your website… so that so many people like me feel happy. I will! I guess I just missed it. Thanks for letting me know.